A little note before I begin this post. 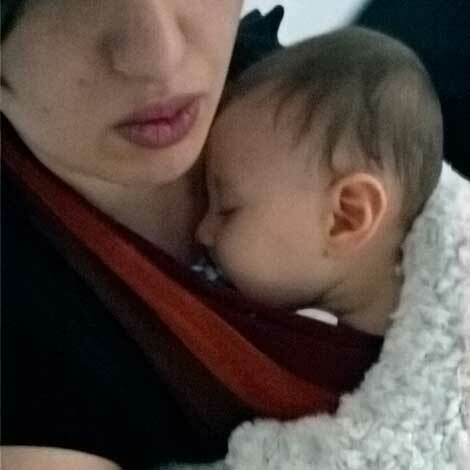 Sometimes I clench my teeth during the night when I’m uneasy, stressed out, or lying in a very weird position (falling asleep while breastfeeding). It happens, I clench my jaw, usually on one side and I end up with a sore jaw for the better part of a week. It always ends up being bruxism rather than something teeth related. This weekend was different. On friday night I ended up falling asleep while breastfeeding while being stressed out not to wake Ma’iq because we were staying at my moms for the night. So I did fall asleep and I ended up clenching my jaw so tightly I actually broke my molar. Nice. I obviously didn’t know I had damaged it and just went on with my weekend because I was so used to the pains and the stiff jaw (neck, head). While scrolling through the blog I felt it was time for a new look. A fresh new blog to celebrate my return to the bloggiverse! I think I need to let go of the past and the guilt of not blogging and take it day by day again! But I did manage to ‘protect my working time’, because I now have a shop and I have actual working hours (yay). So there’s no need to protect it anymore because it’s an actual thing. The other one was to have more me-time. Even though I now have two kids, I don’t have as much of an issue with the ‘me’ time anymore, which I’m very happy with. I re-read Marie Kondo’s book and really did get rid of a lot of stuff! 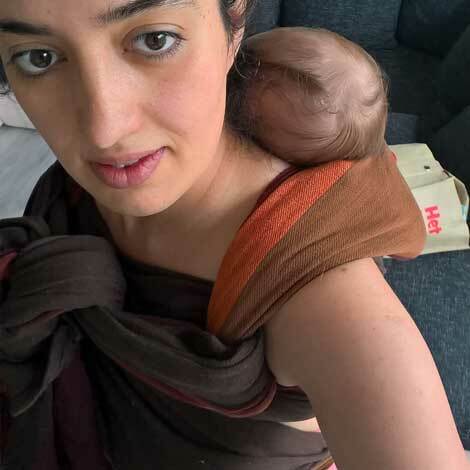 The coming weeks I’m going to clear out some more, so that’s a succes 😉 But the one I’d really like to talk about is the one about ‘mastering’ different styles of wrap carries. I started out like this. 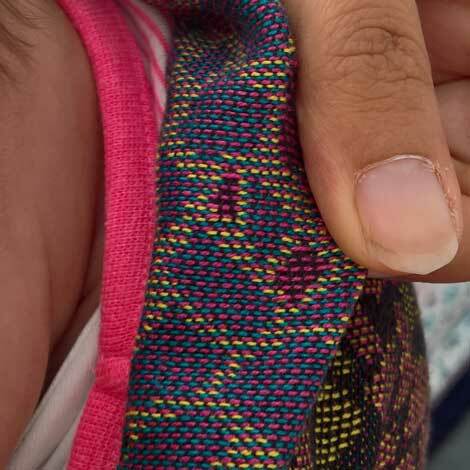 This is the Babylonia Tricot-Slen Cool, which is a stretchy wrap in size 6 (4,6m). 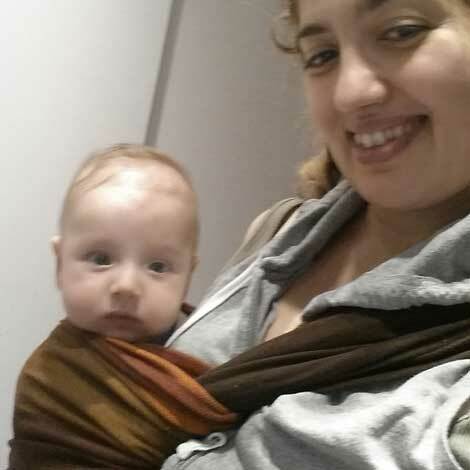 It’s my first wrap and I bought it when I was 35 weeks pregnant and my mom took me shopping. If you care to know you can read about it over here. 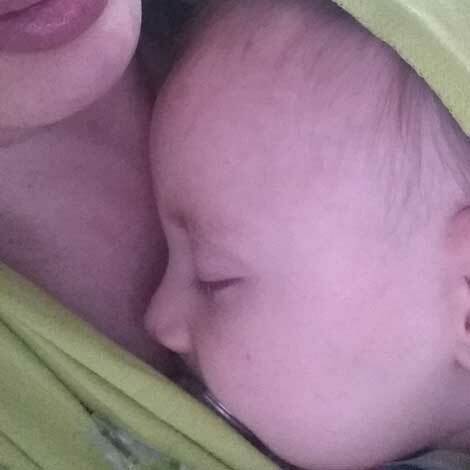 I’ve always had the feeling that I’d be a carrying mom, but I never could’ve known how much I’d love it. You may be able to see it, but this was the first time wrapping and I did a crappy job haha. 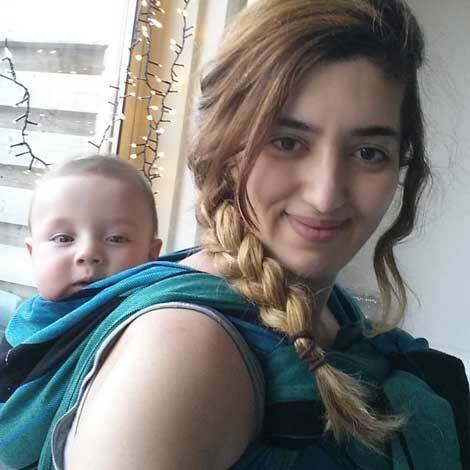 Carrying Ma’iq around as a newborn felt very natural and safe, so I just kept doing it. It also helped that he cried a LOT and not at all in the wrap, so I just went with it. 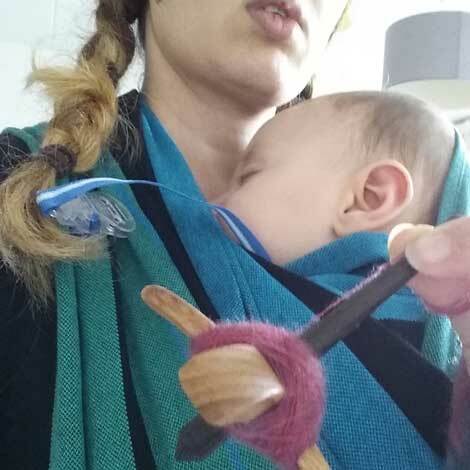 Before long I ordered my second wrap, the Babylonia Tricot-Slen Organic. This is another stretchy wrap, but this one is thicker. As Ma’iq was getting older it was a nice way of keeping him warm and cozy. Though sometimes I didn’t have the warm one, so I’d jus twrap us both in a blanket 🙂 Those were some cozy moments man. 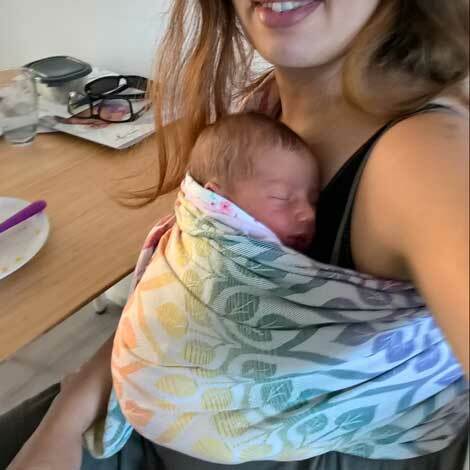 But tiny babies grow bigger and at some point they’re too heavy for a stretchy wrap, and though the thought was very scary I decided to buy a woven wrap. 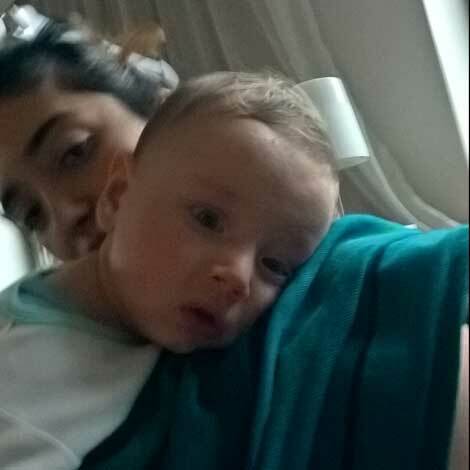 Babylonia BB-Slen. I tried some different wrapping styles because they’re super fancy and a lot of fun! Though fancy carries are a lot of fun, the basic, and most important ones are too! 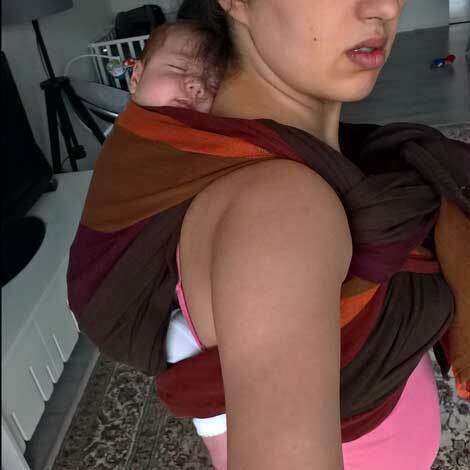 The woven wrap was an eye opener because now Ma’iq could still take naps in the wrap, but it’d be a lot easier on my shoulders and back. 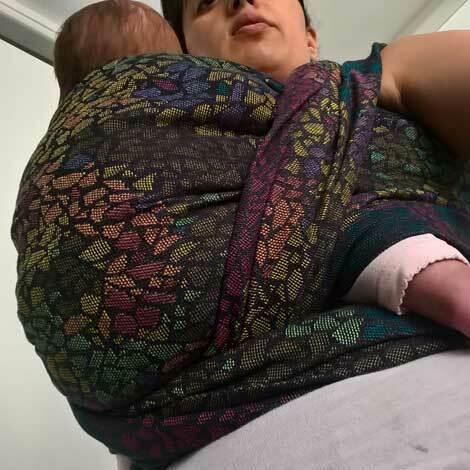 A stretchy wrap feels a lot less comfortable when babies get bigger and start to wiggle around. Whether or not it was because of reflux or something else, Ma’iq had a lot of difficulty sleeping in a normal horizontal position. Even if I’d be carrying him upright (while sleeping), and I’d tilt him down in a horizontal position he’d wake up and cry. Everybody told me I was fussing over him for nothing, but it just didn’t make any sense to me to torture us both. So I always tried putting him in his bed, but whenever he’d fuss or cry after a few attempts, I’d pick him up and put him in de wrap. (a side note here is that he’d only sleep in the wrap maybe 3-4 out of 10 naps, so it wasn’t that big of a deal for me). 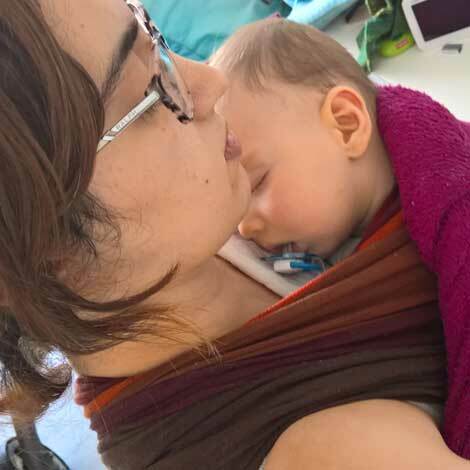 I don’t like to dress my baby warm when I wear him in a wrap because of my own body heat, but I do need to move around and I’m always afraid his back will get cold. A warmer wrap is good in these situations. As Ma’iq got older I got a bit more comfortable with the knots and here’s the first time I attempted to do a ruck. It was very difficult and I can go on and on about what’s wrong with the way I did it. I honestly never carried Ma’iq on my back because I was too scared. I attempted it a few times, but he didn’t like it and he’d stretch. 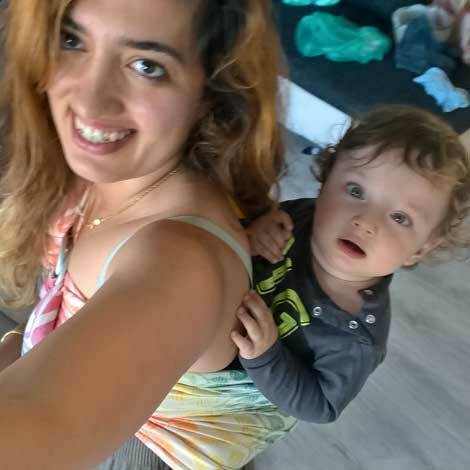 I’d watch all those instruction videos on youtube and see all of those calm and relaxed babies on their mothers’ backs and then I’d have to practice with my stretching and kicking baby. What I realized is that wrapping is actually hugging and it’s a lot of love <3 Every time he’d feel ill he’d want to be wrapped up and he’d sleep it off. The upright position is also very nice when they’re sick and they suffer a stuffed nose. After a while I tried again, and it wasn’t all that bad. I got some help from DH and he helped to hold Ma’iq steady so I could experiment with the ruck. Ma’iq kept stretching his legs and he’d stretch the seat so much it’d get loose and I wouldn’t be able to straighten it out anymore. Though I carried Ma’iq on my back a lot in the early days of the shop, I don’t have a lot of pictures unfortunately. This is how I carried him on my back. This is my Yaro La Vita Autumn Rainbow ringsling and I love it. 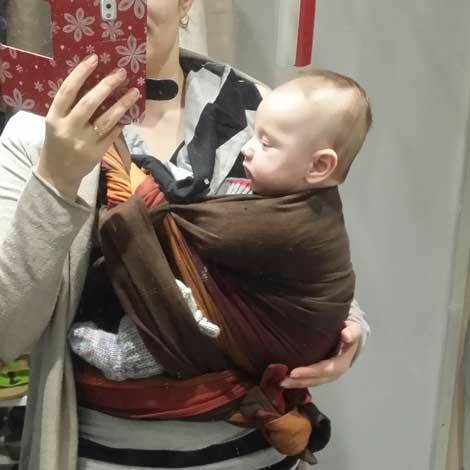 It’s a sturdy, but soft wrap and it works really well when you need to go to the store for some TP and the toddler isn’t having it. But it also works with tiny newborns. 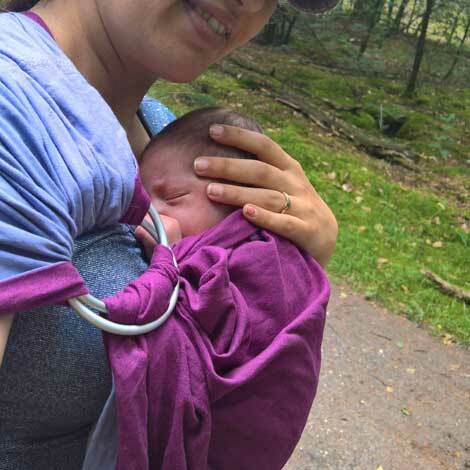 I wouldn’t recommend wearing a toddler in a sling for more than an hour or so, because it’s an asymmetrical carry and it won’t do your posture any favors, but a newborn is a lot lighter and not as fussy. 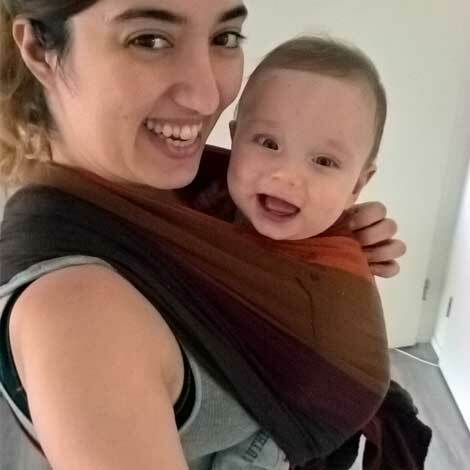 By now I was experienced enough to know that summer babies need a cooler wrap. so I got us a Calin Blue ringsling. 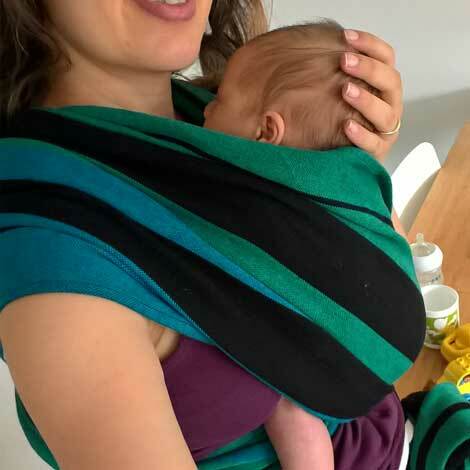 These wraps are super lightweight and very airy. It’s especially nice in the hot summer months. 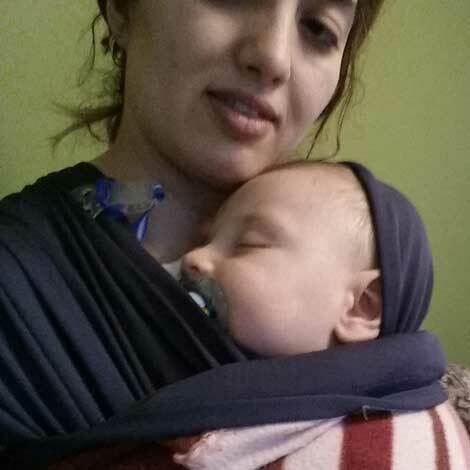 I also have a MAM water sling which is absolutely amazing (No picture sorry). It’s a shorter ring sling with fabric designed especially for use in water, like showers, baths, swimming pools etc. Please note that some swimming pools have banned the uses of water slings because of safety reasons. 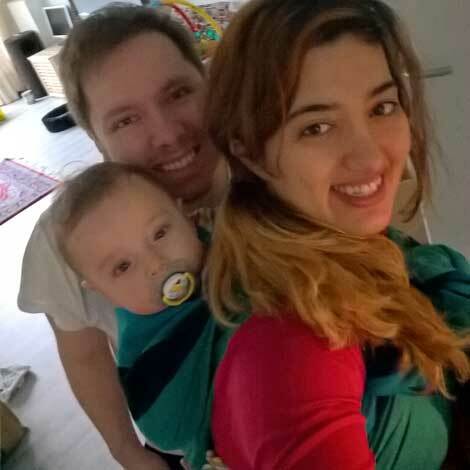 if you go down, the baby goes with you. So far I’ve used it in swimming pools because I don’t go in the deeper pools and stick to the showers and the kiddie pools, so no body has bothered me. I used it for showers with Melina as well. I think every new parent should invest in one (they’re not too expensive, don’t worry). 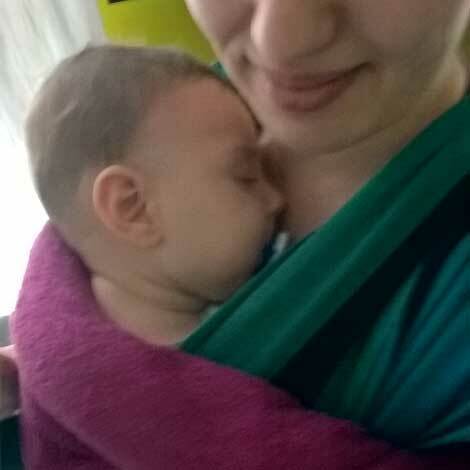 When you have that tiny baby in your arms and you’re supposed to bathe them and you’re scared, this ringsling is worth its weight in gold people. 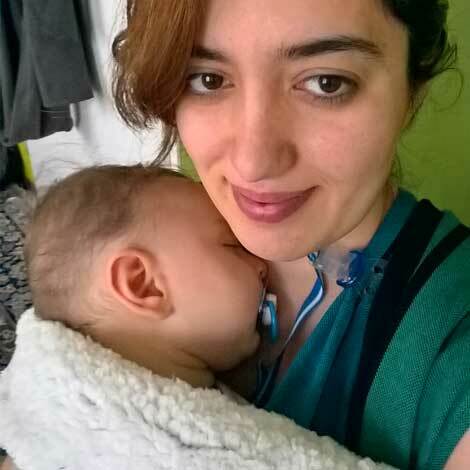 Even though Melina is a very different baby with regards to sleeping, she’s also very comfortable being wrapped. 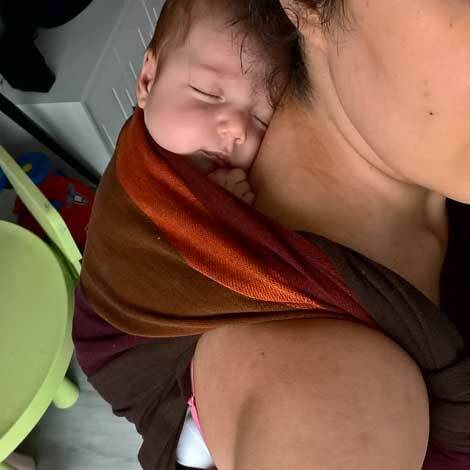 Everytime I put her in a wrap she falls asleep, though she’s not a fan of being carried for too long because she thoroughly enjoys her naps in her bed. I’m still weirded out by that, but I’m learning to deal with it haha. So I had to try it. For one because I wasn’t getting anything done during one of those weeks when Melina had a lot of cramps. The second reason was simple curiosity. 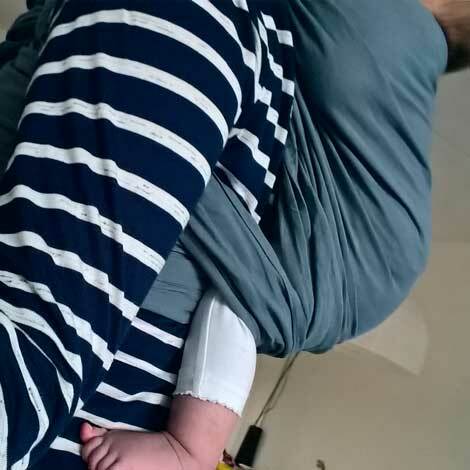 I wanted to know if I could wrap my newborn on my back or not. Note: this is not something I’m going to be doing a lot, and she’s going to grow out of this newborn phase soon enough and I needed to see if I was still scared or not. Newborns are a lot easier to manage in that regard. I finally got her up nice and high, so high even that my hair was giving her a moustache LOL. She was wrapped up snugly and there was no slack, but it was really hard because she’s super tiny. I always tie off with a chestbelt because I’m paranoid. I know the wrap isn’t going to fall off my shoulders, but I’m still paranoid and this makes me feel better. I always make a high seat, and in her case I put the seat so high I secured it in her pants LOL (it was still there when taking her off my back). One of the most difficult things is the size. She’s super tiny, and this wrap is rather wide. 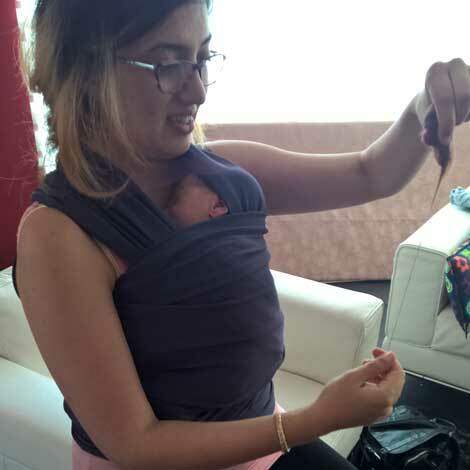 It’s amazing for bigger kids, but for a newborn it’s kind of a hassle. Even though she’s really secure, you can’t wrap the cross over the seat. For one because my arms are too short, and second because the fabric is kind of fat, it’s almost as wide as her leg! I made one more attempt with my other Calin Blue wrap (standard size 6, but these feel a lot less wide because the fabric is much thinner). This attempt was far less succesful compared to the other one, simply because the wrap is different and I was scared to pull on it too tightly because it might hurt Melina, so instead I wrapped it too loose which is dangerous. 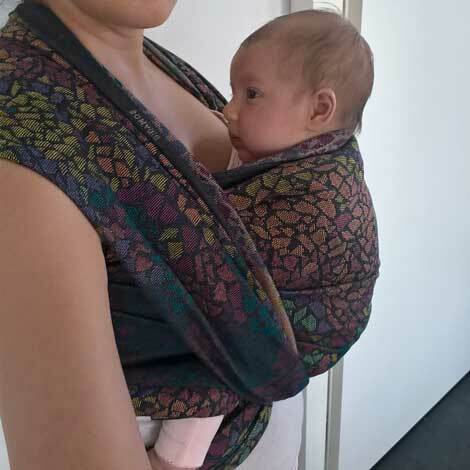 And now I’d like to introduce the latest addition to our family: Didymos Mosaic. Oh my goodness, this wrap is super amazing! At 150 euros this is the most expensive wrap I own and it’s totally worth it! It’s made of certified organic cotton and can be used immediately without being washed because there’s absolutely no residue or chemicals on the fabric. 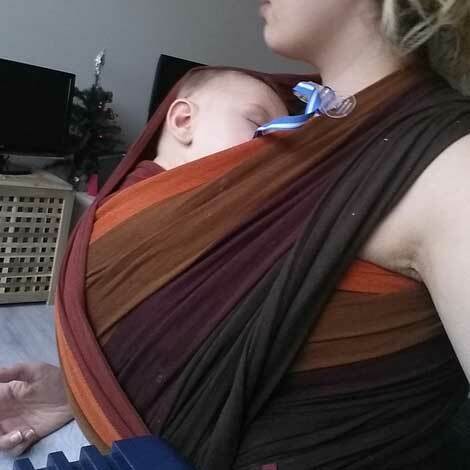 Where most of my wraps have to be worn-in and abused a bit to become soft, this one was supersoft straight out of the box, which is quite incredible.